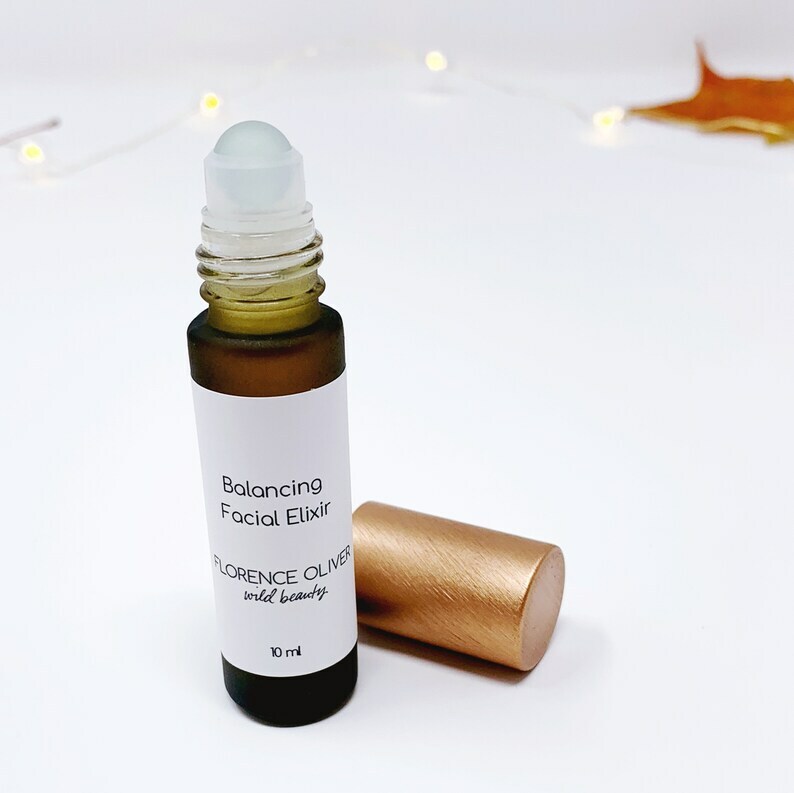 Blended with exquisite essential oils, luxury cold pressed oils, and a premium glass roller bottle, our balancing facial elixir will help moisturize and soothe away winter dryness. Directions: Apply a few swipes to face after cleansing -- may also be used on fine lines. 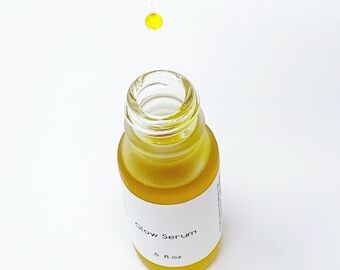 Simmondsia Chinensis (jojoba oil) infused with roses and calendula, rosa canina (rose hip) seed oil, sclerocarya birrea (marula) seed oil, citrullus lanatus (kalahari melon seed oil), punica granatum (pomegranate seed oil), helianthus annuus (sunflower) seed oil, opuntia tuna fruit (prickly pear) extract, mixed tocopherols (non gmo vitamin E), aniba rosaeodora (rosewood) essential oil, helichrysum italicum (immortelle) essential oil, boswellia carterii (frankincense) essential oil, and lavandula angustifolia (lavender) essential oil. Hand blended in small batches with love and intention. All of our herbal oils infuse a minimum of 8 weeks to ensure maximum potency of the herbal blends. 10 ml frosted amber bottle with brushed copper metal cap and glass roller ball. * If you are pregnant, nursing, or have a serious medical condition, consult your healthcare adviser prior to use. * For external use only. *Do not use if you are allergic to any ingredients listed. Florence Oliver products and statements have not been evaluated by the FDA. This product is not intended to diagnose, treat, cure, or prevent any disease. © Florence Oliver, LLC, 2011-2016. No part of the content, designs, images, product design(s) and product(s) can be used without prior express written permission. All rights reserved. I have purchased this Toner Spray many times. It is fabulous!!! I want to share a tip - I spray my back with it after showering - wonderful way to treat that part of my body that I can never reach! Enjoy, as I have, and have a lovely day! Just got it today and Love it!!! Excellent product (ordering to replace a bottle I bought in store) and super fast shipping. Spraying this on my kids’ pillows is part of our bedtime routine. We currently accept payment through Paypal or Etsy direct checkout. We believe in customer satisfaction, you are the heart and soul of our business! Please contact us immediately if you are genuinely unhappy with your item. We are unfortunately unable to accept returns on apothecary goods unless we messed up and sent you the wrong item. If you are genuinely unhappy with your item, contact us and we'll work something out! Orders are shipped within 1-3 days of purchase unless stated otherwise. Most orders are shipped within 24 hours. Once we have handed your shipped item over to the Post Office, we can no longer take responsibility for whether it gets lost, stolen, or damaged. Please contact us prior to purchasing if you wish to purchase insurance for an additional small fee. You will receive an email with your Delivery Confirmation number once your package has shipped. If you are concerned about your package getting damaged or lost in the mail you may purchase USPS Insurance for a small fee. ++ Purchasing an item as a gift and want it gift wrapped? Let us know in the "notes to seller" box. We'll gift wrap it for free and include a handwritten note! ++ Please let us know if you have further questions. ++ We reserve the right to change our policies at any time.